Is there a better alternative to SquareCaster? Is SquareCaster really the best app in Internet Utilities category? Will SquareCaster work good on macOS 10.13.4? 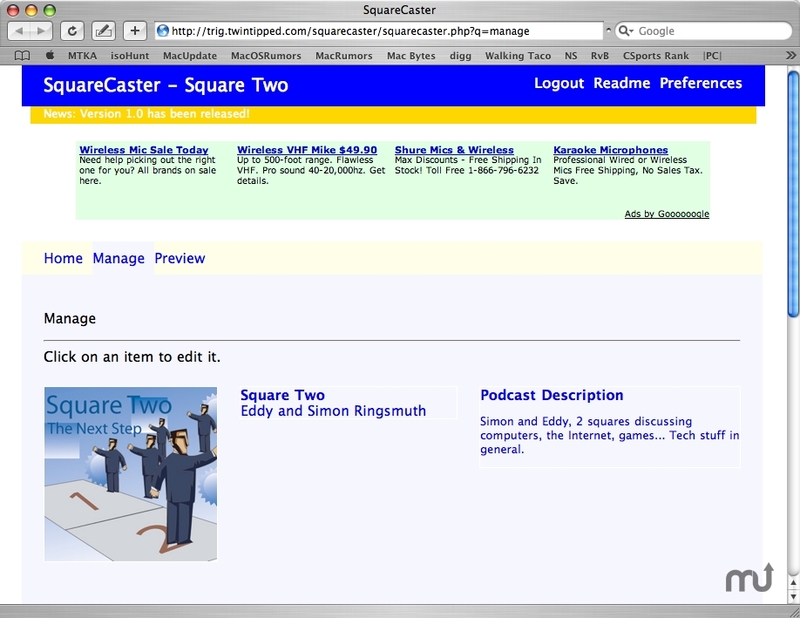 SquareCaster was made by me - Eddy Ringsmuth - simply because up until now, no good podcast rss feed manager existed. If you're like me, you've encountered the unreadable feed error multiple times in iTunes after recording your podcast only to realize that you forgot to change a quote " to " somewhere in your 100+ line rss feed... Anyway, I decided that I had encountered that problem for the last time, and so I set out to make my own error-proof rss manager. SquareCaster is very easy to use. All you need to do is place the included php file in the same directory as your .rss or .xml feed file, on a PHP 4.3.11+ enabled Web server. SquareCaster needs a rating. Be the first to rate this app and get the discussion started! SquareCaster is very easy to use. All you need to do is place the included php file in the same directory as your .rss or .xml feed file, on a PHP 4.3.11+ enabled Web server. Then simply navigate to that page with a Web browser and set your preferences with your feed name (ex. "mygreatfeed.rss") and password (ex. "myh4rd2GueSSpassw0rd").